This entry was posted on November 3, 2014 at 8:30 pm and is filed under Daniel Kehlmann, Independent Foreign Fiction Prize 2015. You can follow any responses to this entry through the RSS 2.0 feed. You can leave a response, or trackback from your own site. I think you would like him, Stu. I’m intrigued by the questions at the end of your review, and it sounds like a great book for discussion. I wonder if it will catch the eyes of the IFFP judges next year? I hope it does make the IFFP long list – if only because I never seem to have read anything on it in advance! Thanks for the link – I don’t listen to the radio much and therefore miss all the good stuff. Very welcome – I am a bit of a podcast addict! Hmmm, sounds very intriguing, and throws up some big questions for discussion. I tried to read Vermessung der Welt by him but somehow got sidetracked (had to return the book to a friend and didn’t find another copy, something puerile like that). Makes me want to seek him out again. I hope you do – I’d be interested in hearing what you think. So far I have read two of his books which I liked and your intriguing review makes me curious to try also this one. I think if you like his work, you will definitely like this one. I read your review to compare it to mine which I just posted. I didn’t read yours before I wrote mine. Your review does a nice job of conveying the major plot points as well as the philosophical issues underlying the novel. Even despite the short story ‘Family’ in ‘F’, I’m still a major fan of Kehlmann. Most people thought the ‘F’ stood for ‘Fate’ or ‘Fake’ but maybe it is ‘Family’. The writer who I see as closest to Daniel Kehlmann in outlook is the French writer Jean Echenoz. I enjoyed your review – the novel is certainly ‘light and playful’ but ‘not easy’ as you suggest. 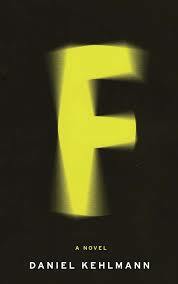 I, too, immediately assumed that the F stood for Fate until I realised that, as it is also the German title, it would also need to refer to a German word beginning with F. Perhaps some German readers can help us out! I can see why you compared him to Echenoz – another of my favourite writers. It’s interesting that both you and Tony Messenger end your review with questions. It’s that kind of book, isn’t it? I hadn’t realised that, but you’re absolutely right. It’s a book you close knowing your work has just begun! You have done a masterful job of reviewing this book, the only part of which I truly enjoyed was Eric’s frenzied running around from one person to another as he wove the web of financial deceit that had encroached upon his whole life. I like how you likened the twisting of the Rubik’s Cube to the twists of their lives. Thank you. The fate versus free will argument is very interesting in the novel – I suspect the purpose of the hypnotist is to raise that very issue.